Even with the lack of snow we have experienced here in Minnesota so far this season, there are still some things we need to be aware of especially with the frequent rising and falling of temperatures and that is the accumulation of ice on sidewalks, driveways, and parking lots. 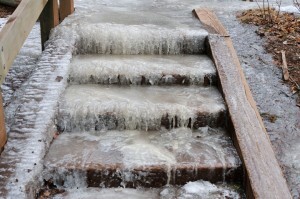 Keeping the ice off sidewalks and driveways is important home maintenance because it keeps the surfaces safe. Salt is very good at removing ice by effectively lowering the melting temperature. Deicers, which all contain salt, are cheap and easy ways to keep ice off. However, the side effects of these products need to be weighed. The chemicals in deicers can make your pets sick, eat away at concrete and brick, and harm the soil your plants depend on. Despite labels that state the product is “Pet Safe” or “All Natural” there is no product that can guarantee these claims. So it is important you weigh the side effects before using a deicer. The best method is to clear slow immediately so it doesn’t have a chance to become packed down and turn into ice. Whether you are a homeowner or a business owner, it is your responsibility to keep those areas safe for those who want to enter your business, walk down the sidewalk in front of your house, or deliver your mail. Anytime we have melting during the day and sub-freezing temps and night, it can create potential hazards in the morning. These dangerous conditions can be dealt with using de-icing materials, mostly in the form of salt. Applying de-icing materials on a regular basis to your homes and businesses will reduces liability and creates conditions that are safe for your families and customers.